To the unscrupulous, y2k is more than a potential catastrophe for society … it’s an opportunity waiting to be exploited for personal gain. And a ruthless mathematician has taken the step that will turn the world’s misfortune into his own private bonanza. With the millennium fast approaching, vast sums of money begin to disappear from Department of Defense accounts, and then from a major bank whose y2k project is headed by British-born Annette Ashby. The culprit? A computer worm. It threatens to spread across the country, even the world, imperiling the global economy – and if the word isn’t found and eradicated before December 31st, banks around the world will unwittingly archive it into their vital data files. Who can Annette trust? The shadow of suspicion has fallen across two men on her year 2000 computer team. Nerd-next-door Leo Hermann has abandoned his prestigious Silicon Valley job for a chance to win Annette’s love. And his rival, the equally brilliant and farm more charming Russian émigré Vladimir Borodin, has his own plans for Annette. 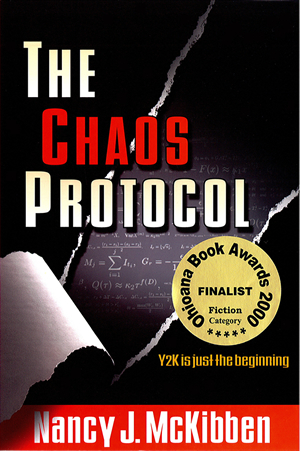 When the FBI and the CIA join the hunt, the action moves to St. Petersburg, then back to the States as the y2k team races the millennium clock to save the world’s economy from the computer worm that could trigger its collapse – the Chaos Protocol. From the literary world . 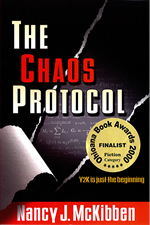 . .
“The Chaos Protocol is a splendid first novel. Nancy McKibben has all the right parts in all the right places. Her characters are vividly drawn, well-motivated, and even the bad guys are likable – at least to begin with. The story is well-constructed and believable, with technical details blended in smoothly enough that even the most computer-illiterate reader should still come away unbaffled. 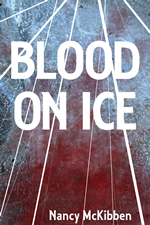 The plot is admirably paced, with suspense rising slowly at first, then fast and fast until the story’s slam-bang climax. Cameron Powell, Writer, Adjunct Professor of Advanced Intellectual Property Law, George Washington University, Washington, D.C.
“Nancy McKibben delivers the goods in The Chaos Protocol. For all your customers who’ve secretly bemoaned the end of the Cold War or wishing longingly that Eric Ambler were still with us and writing, recommend this book. From the Computer World . . .
From the intelligence world . . .
© 1999. Nancy McKibben. All Rights Reserved. The Chaos Protocol logo, logotype and manuscript are the exclusive properties of Nancy McKibben. 2 Responses to "The Chaos Protocol"
So nice to hear from you! Glad to hear you are enjoying retirement.